Steven Kopits is the Managing Director of Princeton Energy Advisors, LLC. He is currently writing a book on supply-constrained oil markets analysis. Once again, we return to the debate over the direction of oil prices, this time led by the high price school. “The problem with Hamilton’s analysis is that it largely ignores the impact of the shale revolution on the economics of oil production and understates the tremendous variability in real oil prices in response to changes in technology. Kemp seems to be arguing that shale oil is a game-changer which will materially change the supply outlook and catalyze a fall in oil prices. To test this assertion, it is worth asking if shale production has actually led to the predicted fall in oil prices. As is well known, the shale surge caused a divergence of the West Texas Intermediate (WTI) oil price, the US domestic standard, from Brent, the international standard. Historically, these two prices rarely diverged by more than a dollar or two. Notwithstanding, from late 2011, surging shale production depressed the WTI price as US supply outran domestic infrastructure capabilities, and government regulations prevented the export of US crude. Have prices fallen since? Growth of field production in the lower 48 states has been impressive, increasing by 400,000 b/d in the 12 months ending in mid-2011, and rising to a gain of 1 million b/d by mid-2012, a pace it has held ever since. How did prices react? In the three months ending July 2011, WTI averaged $98, falling to $88/b a year later. On the other hand, by July 2013, WTI was back to $98, and will close this July around $104. Has surging shale production caused the US oil price to collapse? Not all at. It has been accompanied by increasing oil prices, even in the US. Nor has Brent collapsed. True, Brent averaged $115/b in the three months to July 2011, and fell to $103 just a year later. But it will close this July at about $111/b, not much different from three years ago, and higher than it was at the beginning of the “shale gale.” Shale oil has not led, as a statistical matter, to lower oil prices in the US—or globally—in the last two years. As the chart shows, just as many analysts have contended, the oil supply hit an inflection point in 2005. That year signals the high water mark of conventional crude and condensate production, which is 2.1 mbpd less than it was then. Even if we include refinery processing gain, biofuels and NGLs (these latter two adjusted for energy content equaling about 70% of that of a barrel of crude), we find the oil supply is up only 0.4%, 300,000 b/d, compared to 2005. Virtually all of the growth—92%, on an energy-adjusted basis—has come from unconventionals, specifically, Canadian oil sands and US shale (tight) oil. Indeed, 70% of the net growth of the global oil supply from 2005 through 2013 came from US shales alone. Shales are not the icing on the cake; they are the cake itself. This matters, because shale production in turn depends overwhelmingly on only two plays, the Eagle Ford and the Bakken, where production is expected to peak in 2016 or 2017 or see much slower growth in production as the sweet spots there are exhausted. The Permian Basin may pick up the slack, but to date has not done so in needle-moving quantities. Meanwhile, lagging oil prices are calling into question a number of oil sands projects, particularly those slated to begin production after 2020. Unconventional growth may well be approaching its high water mark. If 1 million b/d growth has led to higher oil prices, what will happen when unconventional growth slows to 300,000 b/d in two or three years? It is not clear that the US independents are profitable. An industry can see a boom irrespective of profits or free cash flow if banks and investors are willing to underwrite the promises of future profits. The internet bubble showed us that. We do not yet know if shale oil and gas will be consistently profitable. We do know, however, that US independents have been massively free cash flow negative in recent years. This does not mean the shale oil, or even shale gas, is unprofitable, even if Shell was unable to make Eagle Ford economics work. It does mean, however, that the industry as a whole is not generating enough cash to cover its capex and the meager dividends these companies pay as a group. It will take a while until truly underlying profitability becomes apparent. Nor are the US independents the marginal producers. This distinction falls to the international oil companies (IOCs), and the marginal projects are in deepwater, the Arctic and the Canadian oil sands. Goldman Sachs has calculated the free cash flow breakeven for several of the majors above $100/b, and as high as $130/b. Even at recent oil prices approaching $110 basis Brent, the majors find themselves compelled to reduce capex. Reduced oil production may well follow reduced capex, just as it has at Hess, the most advanced of the oil companies in rationalization and capital discipline. Now imagine that oil prices collapsed, as Kemp proposes. Oil production has been falling at the majors at a 750,000-1 million b/d as it is. A price collapse would accelerate this process dramatically, just as shale oil production is peaking. How would such an eventuality promote lower oil prices? As the graph above shows, productivity of capital has deteriorated by a factor of four, from $5,300 capex b/d of oil production in 2004 to $21,400 in 2013. This deterioration is net of technology improvements. Geology is not only winning, it is crushing technology. Hamilton’s graph testifies to the grizzly unraveling of the economics underpinning oil production since 2005. For the oil business as a whole, productivity has imploded, not improved. These are, in fact, the downside risks. China is undoubtedly the medium to long term driver of oil prices. If China implodes, it will drag other emerging markets down as well. On the other hand, I may disagree about the likelihood that Middle East peace would lower oil prices durably. But this much is not in question: We are heavily dependent on shales to provide incremental oil, not only in the US, but globally. As we look to 2017, the prospects for oil supply growth look increasingly tentative. US shales may be running their course, even as other countries’ potential remains untested. Oil prices will not rise to fully offset swelling E&P costs, and the oil majors will trim their sails to right their financial ships. Their oil production will continue to fall, and with reduced capex, the pace of decline could well accelerate, even in the face of stable oil prices. In addition, international affairs are in a parlous state. In less than a year, Iraq has transformed from embodying OPEC’s upside potential to being the greatest risk to current production levels. Russia seems intent on provoking sanctions or embroiling itself in a European war. Neither augurs well for its oil exports or expansion of its oil business. The supply upside is ever harder to perceive, even as the downside risks are multiplying. Instead of complacency, we should feel concern. An oil shock is already visible on the horizon ahead of us. Four years later and “hundred dollars here to stay” looks like the worst concluding sentence ever. Kemp had it right. Hamilton had it wrong. It didn’t have to be that way. A fascinating change was happening (shale) and it was no secret. Instead of really pushing to understand shale (digging through literature, analysis, etc. ), Hamilton relied on very flawed semi-amateur analysts from the peak oil movement (Berman and Hughes). In addition, strangely, Kemp seems to have better microeconomic (not macro) intuition than Hamilton. Three years from hundred dollars here to stay. How’s that defense of James Hamilton looking now? Oh and Andy Hall blew up a trading firm. How’s the $100 oil prediction doing? Having in mind this article and the development of oil price in the last six months or so, it would seem that China may be in recession (” China is undoubtedly the medium to long term driver of oil prices. If China implodes, it will drag other emerging markets down as well.”). However, we are probably still in a short-term-period. So I guess we just have to wait and see how fast or how slowly oil price will climb up again. As John Bogle quoted: Nobody knows nuthin! So with $49 oil, did Hamilton have it right, or did Kemp? Hamilton has not faced up, fessed up either. He dances away from a direct…I was wrong and here’s how article. Trying to slide past that. Kopits has been much more forthright. Kudos. Producers and analysts are mostly concerned about production, development and finding costs. However, in my view the biggest change over the last years comes from the demand side. Oil at greater then 70 USD per boe is currently completely priced out of the heating oil market through natural gas, coal, LPG, gasoil (all lower than 20 USD per boe) and even electricity (40 USD per boe). The heating oil market including residual fuel oil stands at up to 15 mill bpd and is currently replaced by cheaper alternatives at a rapid clip (up to -70% yoy in the US and Japan and even Europe). As millions of oil barrels are searching for a new home, the price of oil is currently coming down and it will take a while until this excess supply is worked off by the market. However, when this displacement process is over, the oil market will be much slimmer and concentrated on transportation fuel and organic chemicals. Then the oil price will go up strongly again. Heinrich: this is quite right. But there is also an oil price at which people will start aggressively substituting electricity as a transportation fuel. When Elon Musk finishes building the Gigafactory, we will have a rough estimate of a $17000 battery-cost premium for a fully electric car with substantial range. (This may be a high estimate). This should be compared to the most fuel-efficient car on the road, a Prius with 50 miles per gallon. In the US with typical miles-driven-per-year of 15291, and a potential car lifetime of 10 years, the electric car has cheaper TCO at $5.92/gallon. All these estimates were made in a manner which is overly favorable to the gasoline option. In practice, electric cars last longer than gasoline cars, require less maintenance, and have fewer moving parts to manufacture (none of these savings were included). And cars stay on the road longer than 10 years (it’s up to 11.4). And the battery cost estimate is substantially on the high side. Electricity prices, meanwhile, are staying flat due to adoption of energy efficiency measures such as LEDs, and the exponential deployment of solar panels. Using more optimistic estimates, the convert-to-electric number comes out to $3.42/gallon, and of course we’re already above that. We’re going to see demand destruction in the transportation fuel markets as well. And we’re going to see it start very soon, in the next decade or so. The organic chemicals and plastics markets will take longer, and may never convert, but they’re *small*. Interesting that readers should comment so late on this post. Markets are substantially in flux right now, and it’s hard to say how it will all play out. I agree with Nathanael below that self-driving EV’s represent the primary challenge to gasoline powered cars. They will probably start making a dent after 2020. I would, however, remind readers that China is vastly under-performing its pro forma oil consumption estimates. On paper, China comes back for huge bites of oil consumption over the next decade. My view is unchanged: We will need self-driving EV’s, because the oil supply will not be sufficient to meet all needs over the longer term. One thing I’ve learned as the blog has developed over the years is that search engines bring people to postings for many months, if not years, after the original publication date. So a comment months after the fact is nothing; we had one five years after an original post. huge amount of hamilton’s oil rightness, nothing on coming technological changes in energy use and production! German solar anyone, but then we have been “followers” since about oh 1980. Well argued. It is worth keeping in mind the Gulf States’ habit of withdrawing production by choice when demand weakens, which only lessens the likelihood of a prolonged price drop. Kemp’s biggest failures in my mind were to dismiss the importance of shale oil wells’ faster depletion rate, which is a hugely important fact that everybody needs to think and talk more about, and to tout claimed $60-$70 break-evens as evidence that oil is likely to suffer a sustained fall in price. When producers are anecdotally telling you they can break even at $60-$70, you can bet there would be a big investment pullback at $80. And the point is not to say that a dip down to $80 or even $40 in a deep crisis can’t happen, but that there are countervailing forces namely the need to invest to counteract depletion that would quickly bring the oil price back up again – oh and besides there’s also a cartel that would work towards the same. I agree though that Hamilton and Kopits tend to be oil-centric. We also need to think about how the generally much better outlook for natural gas supply relative to oil will change global economics. I’d say, economies that most productively utilize gas and electric power are going to grow quickest, while economies overly wedded to oil will drag. I do think the shale boom has made Americans overly complacent about oil supplies and we would do well to push hard on electric cars and mass transit. Did Global Crude Oil Production Peak in 2005? In my opinion it is very likely that actual global crude oil production (45 or lower API gravity crude oil) peaked in 2005, while global natural gas production and associated liquids (condensates & natural gas liquids) have so far continued to increase. This is analogous to asking a butcher for the price of beef, and he gives you the price of steak, but if you ask him how much beef he has on hand, he gives you total pounds of steak + roast + ground beef. Shouldn’t the price of an item directly relate to the quantity of the item being priced, and not to the quantity of the item plus the quantity of (partial) substitutes? Insofar as I know, the only complete Condensate/(C+C) data base, from one agency, is the Texas RRC data base for Texas, which showed that the Texas Condensate/(C+C) ratio increased from 11.1% in 2005 to 15.4% in 2012. The 2013 ratio (more subject to revision than the 2012 data) shows that the 2013 ratio fell slightly, down to 15.0%, which probably reflects more focus on the crude oil prone areas in the Eagle Ford. The EIA shows that Texas marketed gas production increased at 5%/year from 2005 to 2012, versus a 13%/year rate of increase in Condensate production. So, Texas condensate production increased 2.6 times faster than Texas marketed gas production increased, from 2005 to 2012. 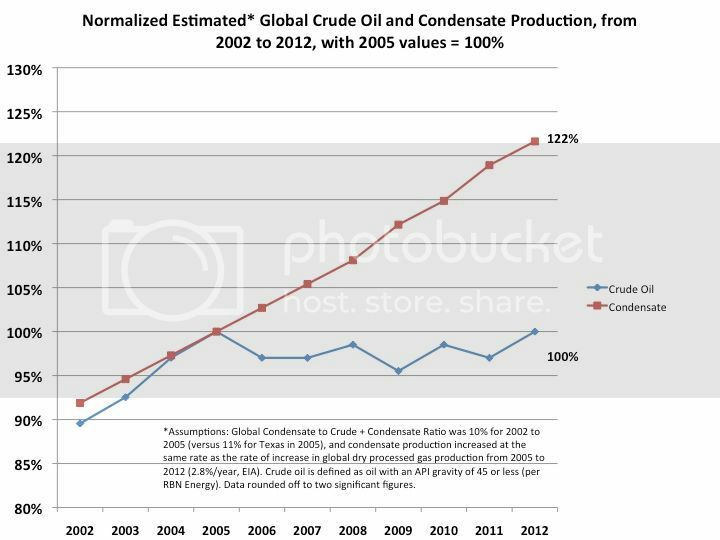 While we don’t know by what percentage that global condensate production increased from 2005 to 2012, we do know is that global C+C production increased at only 0.4%/year from 2005 to 2012. In my opinion, the only reasonable conclusion is that rising condensate production accounted for virtually all of the increase in global C+C production from 2005 to 2012, which implies that actual global crude oil production was flat to down from 2005 to 2012, as annual Brent crude oil prices doubled from $55 in 2005 to $112 in 2012. 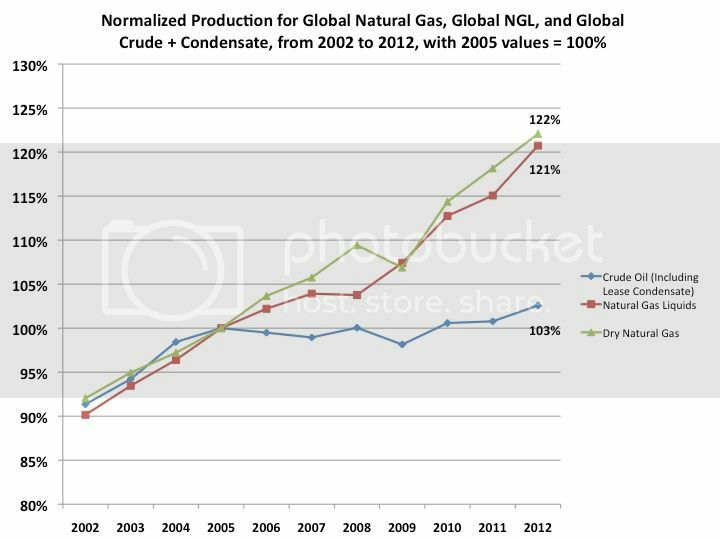 The following chart shows normalized global gas, NGL and C+C production from 2002 to 2012 (2005 values = 100%, EIA data). Based on foregoing assumptions, I estimate that actual annual global crude oil production (45 or lower API gravity crude oil) increased from about 60 mbpd (million barrels per day) in 2002 to about 67 mbpd in 2005, as annual Brent crude oil prices doubled from $25 in 2002 to $55 in 2005. At the (estimated) 2002 to 2005 rate of increase in global crude oil production, global crude oil production would have been up to about 90 mbpd in 2013. As annual Brent crude oil prices doubled again, from $55 in 2005 to an average of about $110 for 2011 to 2013 inclusive, I estimate that annual global crude oil production did not materially exceed about 67 mbpd, and probably averaged about 66 mbpd for 2006 to 2013 inclusive. In regard to Saudi Arabia, based on EIA data (total petroleum liquids + other liquids), Saudi net oil exports increased from 7.1 mbpd in 2002 to 9.1 mbpd n 2005, as annual Brent crude oil prices approximately doubled, from $25 in 2002 to $55 n 2005. As annual Brent crude oil prices doubled again, from $55 in 2005 to the $110 range for 2011 to 2013 inclusive, Saudi net oil exports have been below their 2005 rate for eight straight years. Based on EIA production data and BP consumption data, Saudi net exports in 2013 were about 8.5 mbpd, versus 9.1 mbpd in 2005. In terms of total net oil exports, what I define as Global Net Exports of oil (GNE), GNE fell from 46 mbpd in 2005 to 44 mbpd in 2012, and probably to about 43 mbpd in 2013. Furthermore, the developing countries, led by China, have so far been consuming an increasing share of a post-2005 declining volume of GNE. What I call Available Net Exports, or GNE less the Chinda regions’ net imports, fell from 41 mbpd in 2005 to 35 mbpd in 2012, and probably to between 33 and 34 mbpd in 2013. I addressed these topics in considerably more detail in an extensive response to Mr. Verleger’s comment on the Econbrowser post (referenced by Steven Kopits above). However, I always find it interesting when someone calls it “nonsense” to stipulate that the finite sum of discrete sources of oil that peak and decline will also peak and decline, and Mr. Verleger’s comments are typical, in that he tends to make qualitative objections to quantitative arguments. This is an interesting but very oil-centric debate. If we look at the coal market we see huge over-supply and an inability to restrain production. LNG spot prices in Asia Pacific have halved in the last five months to pre-Fukushima levels without a Japanese reactor coming back online. The rate of Chinese energy demand growth is slowing. This is in large part a lagged cyclical response to a long period of high and rising prices that has ended. The oil price (Dated Brent for arguments sake) has been on average stagnant since 2012. For lots of reasons the oil market is stickier, more complex and uncertain than coal or LNG, but it too has experienced a rise in productive capacity and a wave of technical innovation coupled with increased capital investment. The argument that oil prices may be returning to longer term trend is plausible. Rather than a structural upward shift in energy costs across the hydrocarbon complex, the high prices periods of 2007-08 and 2010-11 may start to look like aberrations. We see very significant substitution, for example, in refinery and other applications like home heating. As for coal, keep in mind that China added two US equivalents of consumption in the ten years to 2012, and will add another by about 2020. This kind of growth in China’s oil consumption is still ahead of it. Thus, China could easily add 2 US equivalents of oil consumption to 2030 were the supply available at historical prices of $55-65 / barrel. That represents some 36 mbpd, and no believes the oil supply could accommodate such a volume, much less that plus other emerging market demand. If we consider supply growth, $2.5 trillion (trillion) of upstream spend in the legacy conventional C+C supply has not been able to move the needle, now more than eight years later. While productivity in shale drilling has improved, productivity in conventional production significantly lags the pace at which geology and location are deteriorating. It is possible that this huge wave of capex by the oil majors will produce a rush of oil. Exxon, and particularly Chevron, show production guidance which would support such a view. Nevertheless, actual production at the majors is as the graph above shows. After eight years of robust investment, oil production at the majors is 2.5 mbpd lower than it was in 2005. The majors are and will continue to divest production in order to fix their income statements. Thus, even as new projects come on, we will probably see divestments which will tend to negate these gains. Hess and BP are examples. If you actually speak to the managers of the oil majors, they will, without exception, note the difficulty they are having in finding and delivering new oil at the economics which the market will bear. Technology may yet save us, but the balance of data is running against that view at present. Coal supply is essentially unconstrained. Thank goodness people are switching away from it because it’s *dirty*. Because it’s going to stay cheap for a long time. Natural gas supply does have constraints, but they’re rather more complicated. It’s actually a much more interesting case to study. There are roughly four sources of natural gas: coal, oil, standalone deposits, and renewable. The main constraining factors are storage and transportation, which are hugely difficult. Philip, while I can appreciate your opinion; although I disagree with it, it provides no substance in the way of a rebuttal to the article… Mr. Kopits did a fabulous job in addressing both previous articles. Normally, we would think of the marginal barrel as being produced by the high cost producer. It is certainly true that the Saudis have traditionally been able to expand or contract their production and thereby admit or evict the marginal producer to or from the market, as the case may be. But who is that marginal producer today? Production is of course heterogeneous. All the larger producers have lower and higher cost wells. However, if we look at them as a group, the oil majors look to be on the bubble, at least compared to the independents. If the majors are unable to hold capex levels even as these increase at the US independents, then we would have to conclude that it is the majors who are being evicted from the market. Of course, we have to caveat that with the chart above, that the negative free cash flows of the independents make it hard to judge exactly where they are on the cost curve. But then we have a problem. Who is doing the evicting? Saudi production is near historic highs, but essentially unchanged over the last three years. Libya and Iran remain largely off the market. No actor is kicking the IOCs out of the market. Just the opposite. The loss of Libya and Iran should invite marginal actors into the market. It is certainly true that oil prices have remained high and uncommonly stable. Then why are the IOCs cutting capex? The reason is that costs are rising faster than revenues. They are being evicted from the market by geology, not market participants. So, if we have to take a stab at who the marginal producer is, the data points to the oil majors. There may also be NOCs facing similar issues, but their financials tend to be less transparent. As a result, I might be placing too singular a focus on the majors, but there is no question that they are struggling, in terms of holding oil production and capex, more than the US independents. That’s probably not what you meant. Either way, the information in this blog is right on. It is a constrained supply that is leading to these high oil prices and no matter how much shale is drilled it will not reduce the market price. One place where I would disagree with Steve–and I’m the one who hit the button to publish it–is the identity of the marginal barrel. All you need to do is look at the OPEC production figures that come out each month and you can see that the marginal barrel is being added to or withdrawn from the market by Saudi Aramco. So the question really would be if that production wasn’t subject to withdrawal as OPEC–excuse me, Saudi Arabia–raises or cuts production to what is the marginal barrel, what would it be? And then the argument really becomes whether it’s a deepwater Gulf of Mexico barrel, or a shale barrel, or an oil sands barrel. That answer would then be complicated by whether grade differentials would be affected by subsequent movement in the Brent-WTI spread should the Saudis back away from their role as marginal barrel supplier. Philip…..tell us what is wrong with this article. The author seems to make a well reasoned argument. Where exactly is the BS in it? John Kemp is actually a good economist. The author of this comment is not. Jim Hamilton is an excellent econometrician – but knows little about oil. Like many in my profession (econometrics) he takes data on computers as the truth. Platts should stop publishing this type of nonsense. It degrades the publication.